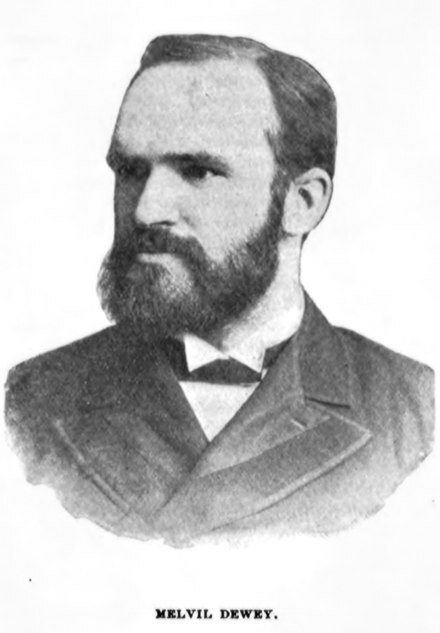 The Dewey Decimal Classification (DDC), or Dewey Decimal System, is a proprietary library classification system first published in the United States by Melvil Dewey in 1876. It has been revised and expanded through 23 major editions, the latest issued in 2011, and has grown from a four-page pamphlet in 1876 with fewer than 1,000 classes to a four volume set. It is also available in an abridged version suitable for smaller libraries. It is currently maintained by the Online Computer Library Center (OCLC), a non-profit cooperative that serves libraries. OCLC licenses access to an online version for catalogers called WebDewey. The Decimal Classification introduced the concepts of relative location and relative index which allow new books to be added to a library in their appropriate location based on subject. Libraries previously had given books permanent shelf locations that were related to the order of acquisition rather than topic. The classification's notation makes use of three-digit Arabic numerals for main classes, with fractional decimals allowing expansion for further detail. Using Arabic numerals for symbols, it is flexible to the degree that numbers can be expanded in linear fashion to cover special aspects of general subjects. A library assigns a classification number that unambiguously locates a particular volume in a position relative to other books in the library, on the basis of its subject. The number makes it possible to find any book and to return it to its proper place on the library shelves. The classification system is used in 200,000 libraries in at least 135 countries. The major competing classification system to the Dewey Decimal system is the Library of Congress Classification system created by the U.S. Library of Congress. Write to webmaster@gkv.istanbul .. ® .. Picture Window theme. Powered by Blogger.